Drawing on classic French style, Jacques Ferrier Architectures designed the gorgeous French Pavilion for the Shanghai World Expo, which welcomes visitors inside a green-walled “Sensual City”. Dezeen recently showcased a set of photos of the recently completed pavilion, which is covered in a concrete trellis-like structure and decorated with manicured French gardens, a green roof, ponds, and water fountains. Guests will be able to see, hear, taste and smell France when they visit this beautiful pavilion. The Shanghai Expo kicked off this weekend, welcoming hundreds of thousands of visitors inside a stunning set of international pavilions. Before the Expo began, photographer Montse Zamorano, had a chance to take a first-hand look at the French Pavilion to check out the orderly gardens, which are the main focus for this beautiful building. Plants, bushes, and flowers cover the courtyard, roof and even the interior walls of the courtyard, while pools and water fountains help to cool the air. Throughout the expo the pavilion will feature classic French films, samples of French food, French paintings and perfume, and French Champagne served from special Shanghai Expo bottles. All of these offerings let visitors taste, smell, see and hear the glamor of France. 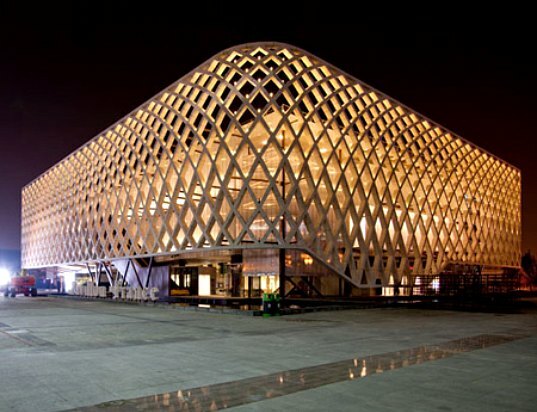 The pavilion’s lattice-like exterior shade is constructed from “special concrete” and gives the sense that it is floating. Although, not a particularly green pavilion in terms of eco design, the use of the interior gardens, living walls and water features is inspiring and beautiful. 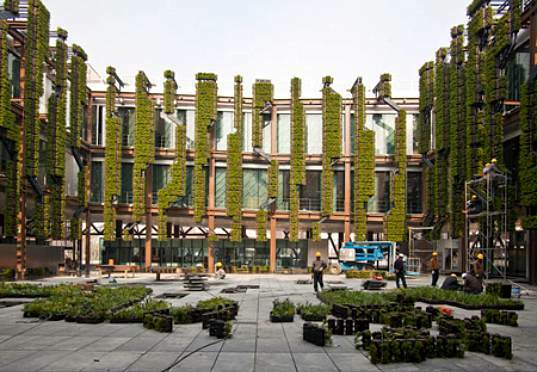 Drawing on classic French style, Jacques Ferrier Architectures designed the gorgeous French Pavilion for the Shanghai World Expo, which welcomes visitors inside a green-walled "Sensual City". Dezeen recently showcased a set of photos of the recently completed pavilion, which is covered in a concrete trellis-like structure and decorated with manicured French gardens, a green roof, ponds, and water fountains. Guests will be able to see, hear, taste and smell France when they visit this beautiful pavilion.